Pinwheels with patterned paper...say THAT 3 times! I made my pinwheel by watching some videos on YouTube, here. My squares were 2 inches for this standard card size, 2 inches allowed me to get 3 pinwheels on one card. 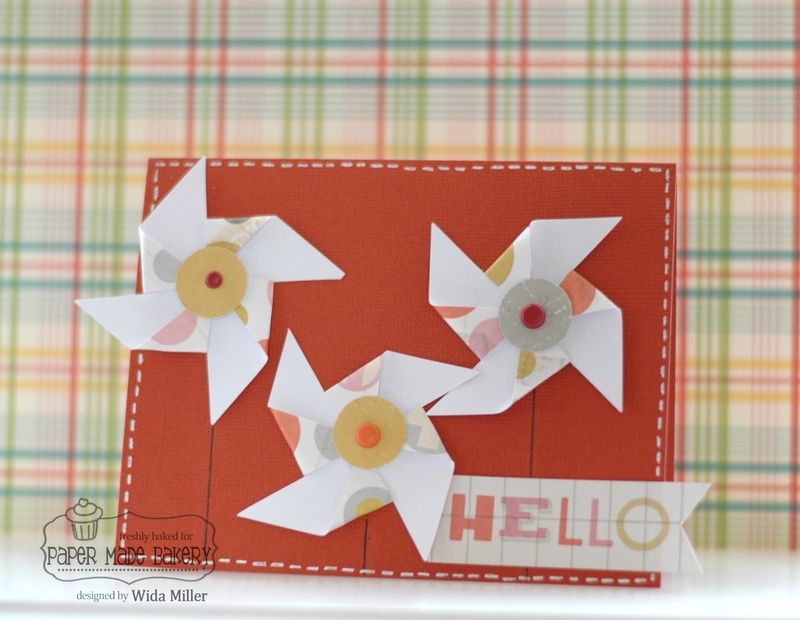 My pinwheels were a little flatter for easier mailing and I covered up my glue with the circle punch and brad centers. The sentiment was from one of the tags from the kit. How about this spread from this month's Paper Made Bakery Kit! It's the end of the month and so we have to say goodbye to Old School. But I am not sad, because a new kit is just a few days away!!! I s i t m e y o u r ' e l o o k i n g f o r ? Today is my last September Old School Kit post. Can you believe that Monday is OCTOBER? I gotta tell you, Monday is going to be crazy fun...stay tuned! I wanted to really let the text take the show...no stitching on this one because I thought it would take away from the design on the background panel. 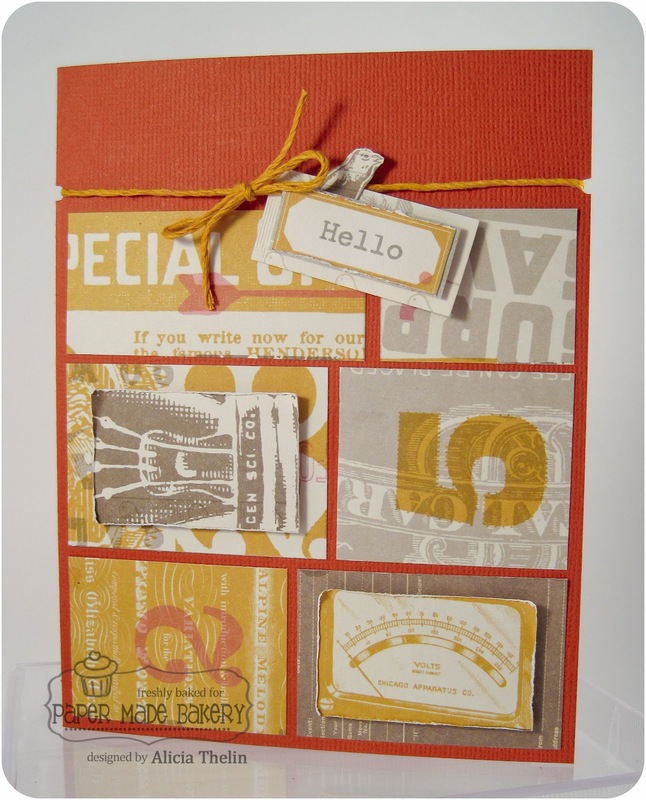 Just a crisp design using the Cosmo Cricket paper and element tag from the kit. I used my own hello die and button. I'm seriously digging that Lawn Fawn hemp cord...it really behaves itself, kwim? It doesn't go all squirrely! Well, the September Old School is Sold Out but now is the time to get signed up for the Baker's Dozen Subscription...you are NOT going to want to miss October's SWEET kit. That's it for me...thanks so much for stoppin' by...I really appreciate it!!!! the colors, the subject matter = Fall. even though I could do so many more! one piece of patterned paper. cut them into individual pieces. the eye around the card. This little bird was a last minute add-on. visual attention to the greeting. Oh well, I like him anyway. Happy weekending to you all! 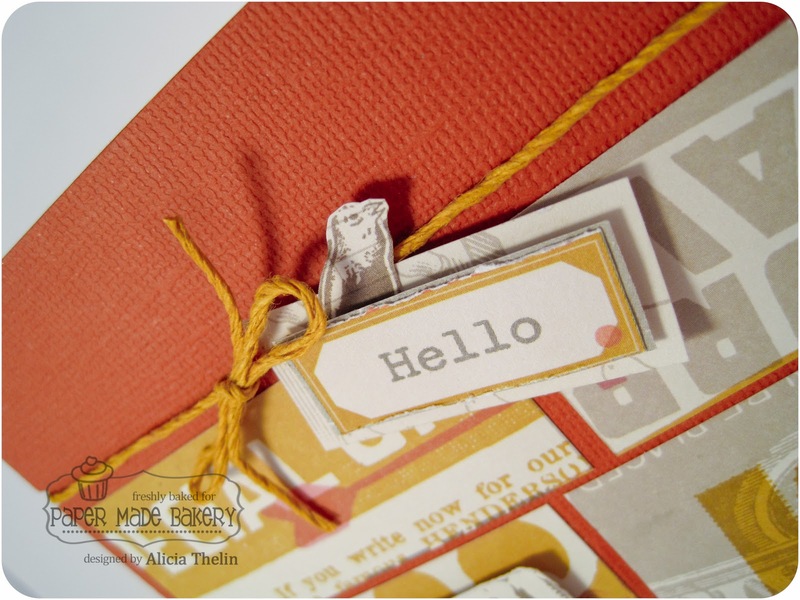 Hello PMB friends, this is Michelle here today with my take on a Hello card. If you have a more CAS style, just omit the layers and stamp directly onto the cardstock. I just love Lawn Fawn's Stay Tuned stamp set from this month's Old School kit. 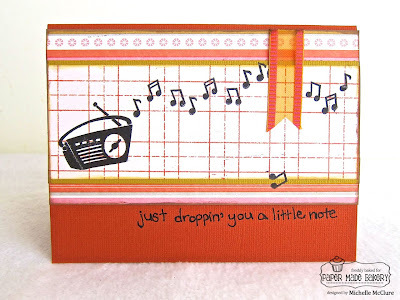 I decided to feature the triple music notes stamp, along with the radio. I cut apart the notes so I could vary the order and shape, or just use a single note. There are so many related expressions that can be adapted into card sentiments. It is kind of fun to match one to the stamps. 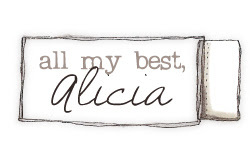 I hand wrote my sentiment underneath the central block. I wrote in pencil first to make sure the spacing was correct, then I traced over with a black pen. Who knew audio visual equipment could be so versatile on projects? I hope you are enjoying all the Old School projects this month. 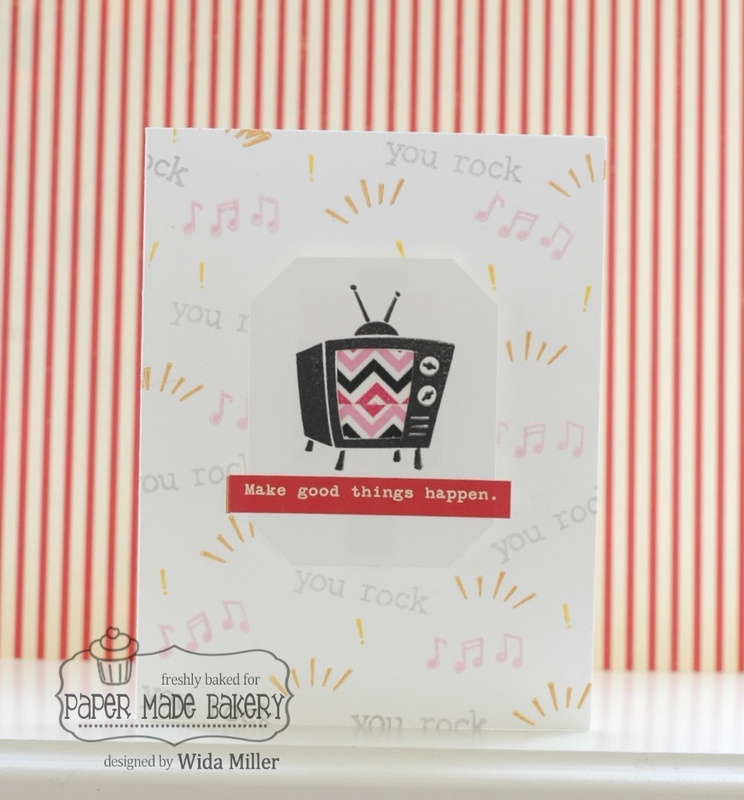 Be sure to come back soon for Paper Made Bakery's next reveal, blog hop and giveaway! Welcome to my last class for the Paper Made Bakery Old School September kit. 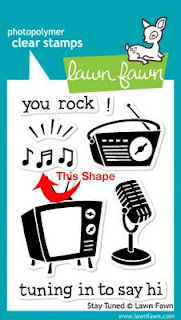 Today, we are going to study shapes. Well, just one really... the hexagon. Unfortunately we are already sold out. Boo. But don't worry, we have a new fabulous kit for October. You won't want to miss out on that one. Now back to our shapes lesson. 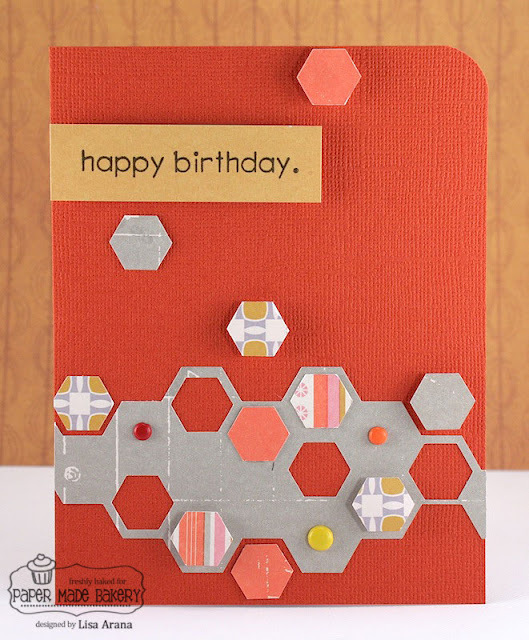 Shapes are fun and hexagons are a BIG trend right now. Don't you love how they just float up the page. Lots of great movement. It reminds me of the game Tetras. Which I never recommend playing while in school, but at work, it is perfectly ok. Lol. 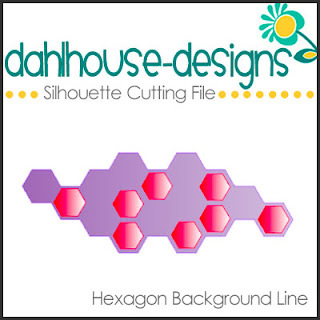 I created the hexagon shape in the Silhouette software. And for your homework, you are to download it and use it! :) Just click on the image below and you can download the .studio file for free. 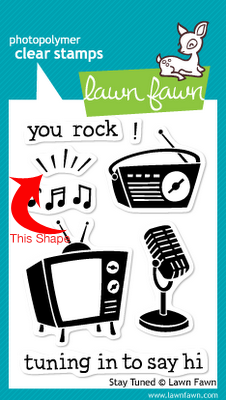 Sadly, it is only for the Studio software, I don't know how to convert it to an SVG. I also have a short video with a few tips on how to use the file in the Silhouette Studio Software. Thanks for joining me for today's lesson, class is dismissed. Ha. Have a super wonderful Wednesday. 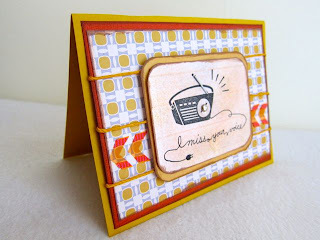 Hello friends, Jennifer here with my final post for this month using the wonderful Old School kit! I've had a wonderful time with this kit and have been so inspired by the rest of the DT! Fun stuff!! I used half of my library card on a project for our blog hop earlier this month but kept the other half and tucked it into the little envelope. See, you can't even tell the whole card isn't there and I got to use it twice! 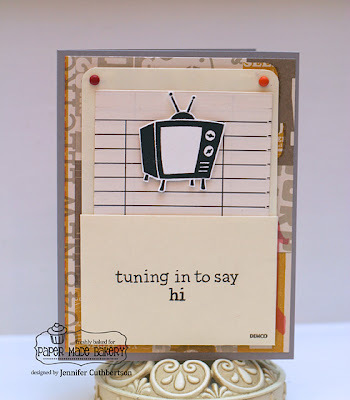 :) I stamped the little telly from "Stay Tuned", fussy cut it and adhered it to the library card. I finished the card with two of the little brads from the kit. 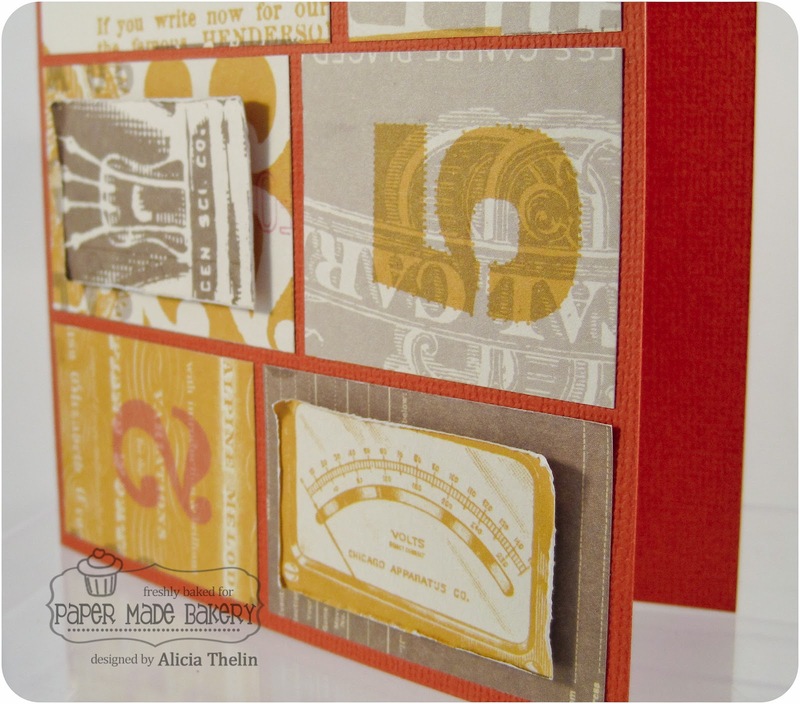 I did use a piece of gray cardstock (not included) for my card base as I wanted to tie in that lovely gray from the patterned paper. Thanks so much for visiting today and I hope you enjoy the last week of projects using this amazing kit! How fun and easy is making cards with these great tags?! Great job Melissa!! These are fab-ilicious! 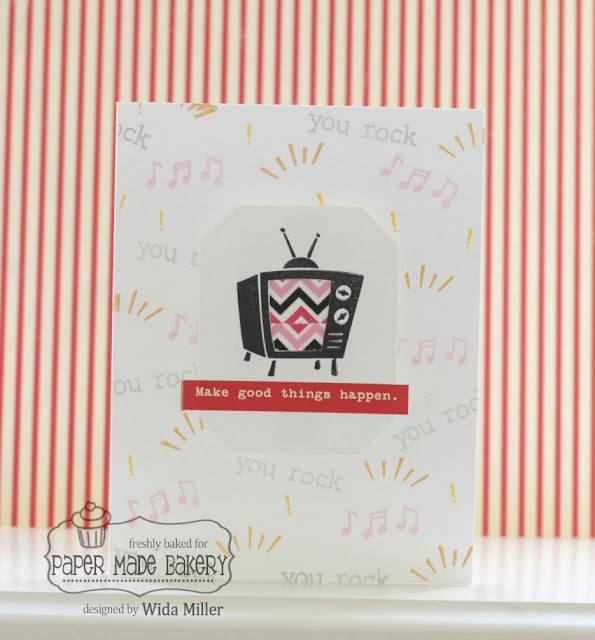 We love to see your creative spirit, so be sure and share your Fresh Baked Kit creations in our PMB Flickr Gallery (look up to the menu bar)! Do you think I should have put a border either with a stitch, faux stitch or inked the edges on the label? I couldn't decide. It looked dimensional in person and I like the crispness of it, but maybe something to make the label stand out more? Designing a card is not as simple as it seems! I used washi tape to give the TV some static. created my own background with the stamp set from Lawn Fawn. 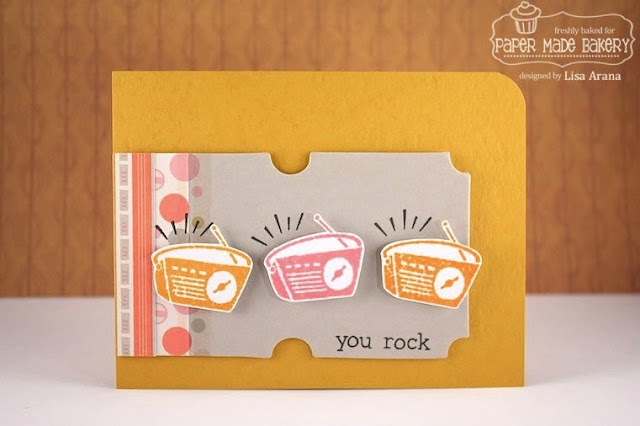 It's Amy T here with a card for you today! I so love the September Old School Kit! 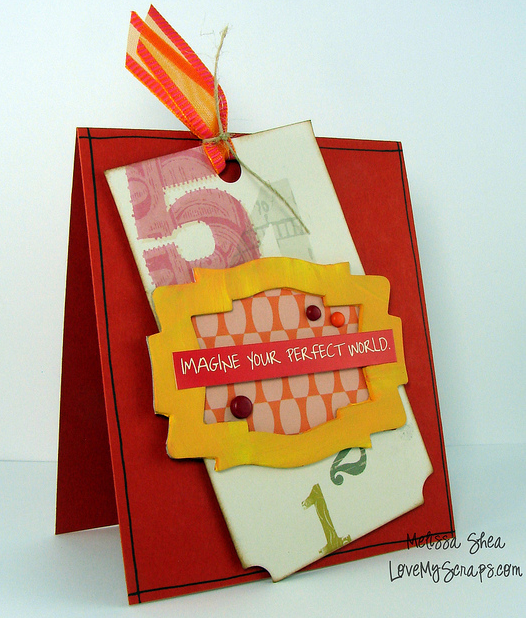 The cardbase is Bazzill Saltillo, I'd call it a cayenne pepper color...orangey/red..and texturey...awesome combo! The "Things I Love" die cut is straight from the Cosmo Cricket Elements deck...I popped that strip of cork on the top and did some zig zags. 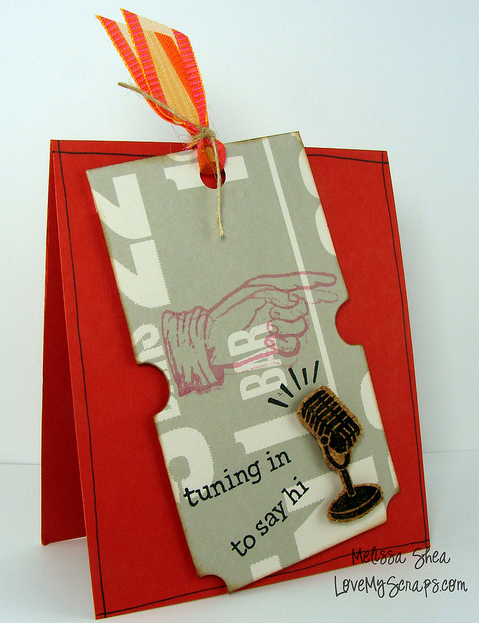 The alphas have been die cut using a sizzix alpha and Cosmo Cricket 2WENTY-THR3E paper. I always love the look of stitching through the alphas. 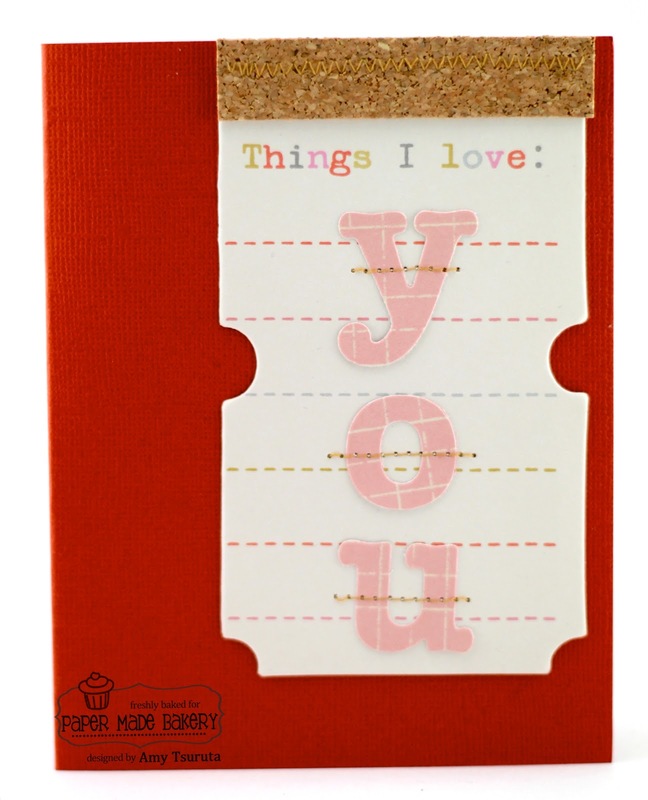 I super love using that cork, it's totally manageable...sewing, diecutting...you name it! Get your September Old School Kit TODAY!!! to remember how awesome she is. she realizes and she IS a rock-star. 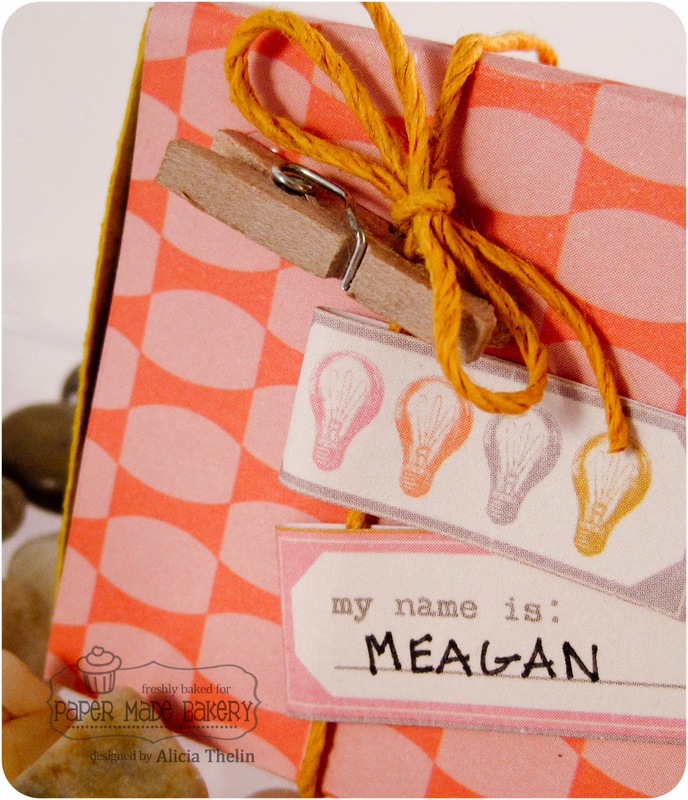 Fun trick: I used the tiny patterned paper as a tag. I stamped on the rock with Palette Hybrid Ink, Noir Black. run into once in a while. Old School Kit for September. 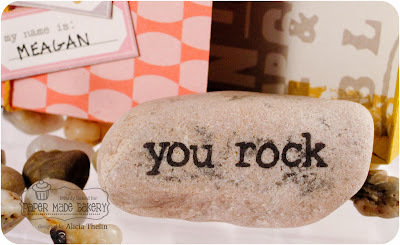 well, except for the rock. That came from my front yard. 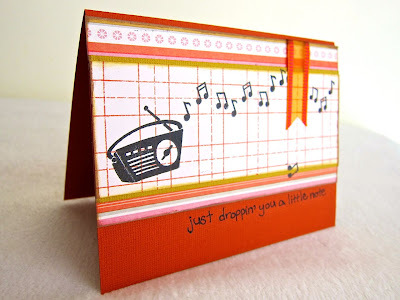 Hello PMB friends, this is Michelle here today. 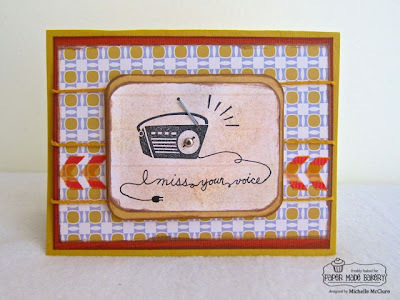 I was playing around with this month's Stay Tuned stamp set and I ended up with this I Miss You card. When I first viewed the stamp set, I didn't know what the little lines were supposed to be. I quickly figured out it was to represent sound. I decided to build a card around a sound premise. 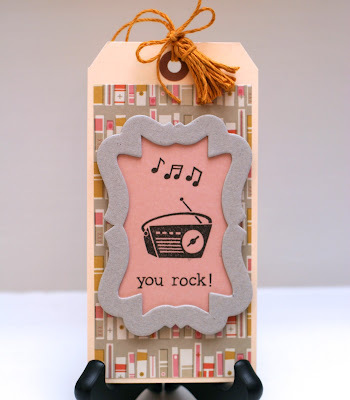 I stamped the transistor radio onto a piece of patterned paper. I added a brad on the tuning knob and a paper clip to the antenna. Originally I was going to cut off a part of the clothes hanger paper clip to make the antenna, but I just didn't have the heart to dismantle it, so I used a regular paper clip. But all the contents are included in this month's Old School kit. 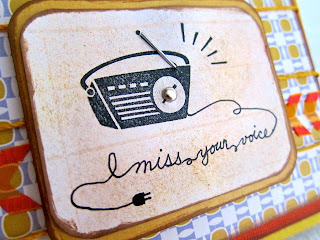 I lightly wrote the sentiment with a pencil as the power cord to the radio. Then, I traced over it with a black pen. I wrapped the background three times with the Lawn Fawn hemp cording, but it still looked a little plain to me, so I added some trendy chevrons. 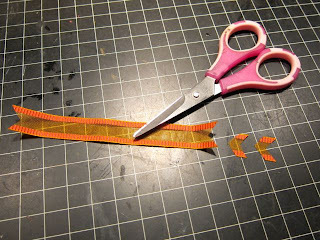 To make the chevron, I trimmed the edge of the May Arts ribbon. I snipped off little pieces of the edge using the same angled cut. It added some visual interest to the background and brought in the orange from the matting. In the style of the American Idol judges, take the stamps and make them your own. Old School Kit and me too. I'm rockin' out with the Stay Tuned stamp set again! This time I'm using one of the super cool element deck tags. 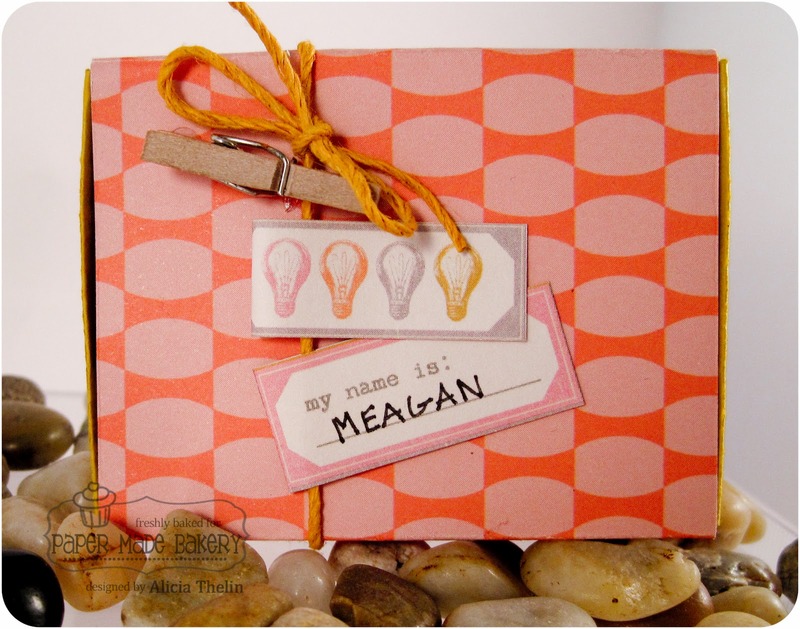 Here is a quick tip... the element deck always has a hole punched at the top of the tag. Sometimes, it is handy if you want to tie on some ribbon. But, when you want to use it as a panel on your card, um, not so handy. 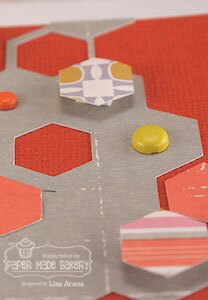 Easy fix though, just take a little strip of patterned paper and layer it on top. Looks like it is suppose to be there, right? That is all from me today. Hello friends, Jennifer here to share a tag with you that I made with this month's Old School kit, as well as a tutorial on that little tassel tied to the top! These little tassels are so fun and easy to make and they'll be perfect to add to your upcoming holiday projects! I wrapped the twine from the kit around a medium sized shipping tag - you can also use a piece of cardboard or heavy cardstock. The size of the tassel will depend on the width of the cardboard used. Pull the wrapped twine off of the cardboard and use a piece of twine to tie a knot in the center. This piece of twine will be the "hanger" so the length is up to you. Pull the loops together and snip them to make the tassel. Keep the two ends of the center knot together so you can use them to tie it on to something. To finish the tassel, I tied a piece of twine around the base, which gives it a bit of a broom look. I tied it to the tag finishing it with a little bow. 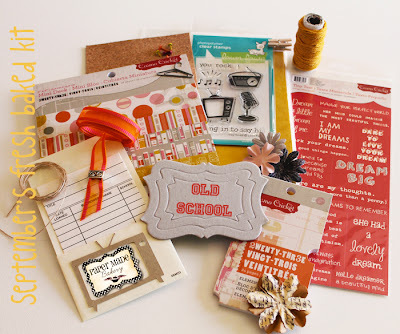 All of the supplies except for the shipping tag can be found in this wonderful kit! I hope you have a chance to get one because I just know you'll love it! tuning in to say hi! 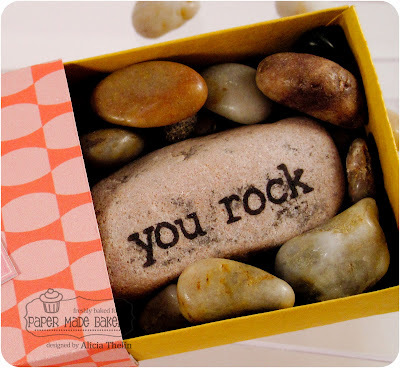 You Rock Card, No Really, YOU ROCK!